Whether you are looking to study real Japanese straight from Tokyo or you want to learn more about Japan's contemporary art and culture scenes, this beautifully designed anthology will acquaint you with a rising generation of award-winning and influential creative minds. The art, essays, interviews, and fiction collected here examine a wide array of subjects -- from cyborg feminism and mustached dogs to architectural apparitions and manga heroes. 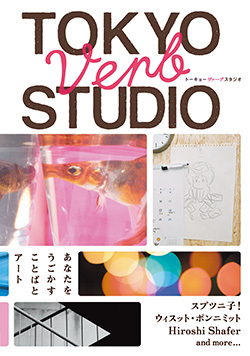 Tokyo Verb Studio notably features Sputniko!, Wisut Ponnimit, Soeda Kohei, Hiroshi Shafer, Tatsuya Ando, Ryan Sayre, Keisuke Tsubono, Matthew Chozick, Midori Ohmuro and others. An appreciation for book design and a high level of Japanese reading proficiency are recommended.